The Christmas Chronicles would have made for a pretty epic horror movie had it been directed by John Carpenter. A fan took some time to make a trailer for an imaginary movie that mashes up the Netflix holiday hit with horror, and it looks truly incredible. While Christmas has already come and gone, it's always a good time to celebrate horror movies and this fan edit, titled Yuletide, would be an excellent addition to any fan's collection. Unfortunately, this only exists as a 3-minute trailer on the internet. 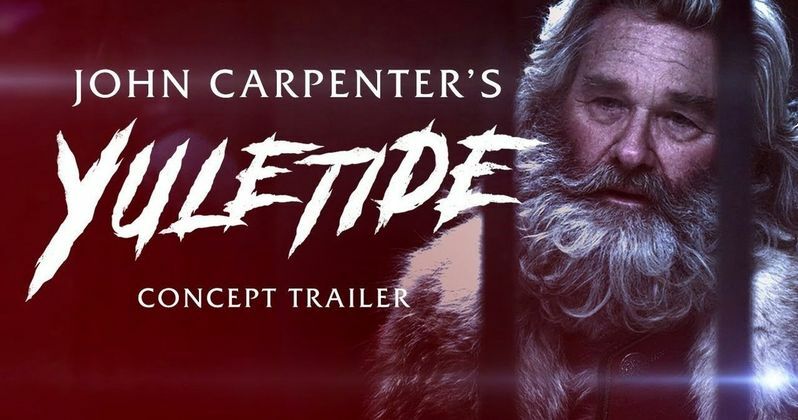 When The Christmas Chronicles was first announced, many horror fans wished that it was a sequel to John Carpenter's 1982 classic The Thing, which also starred Kurt Russell with a beard. However, YouTuber P.L. Boucher took that idea and ran with it, turning the project into something else completely. He took the Netflix holiday movie and edited in footage from various horror movies, including the 2011 prequel to The Thing, and the results will make you want to see the imaginary movie. One comment on the video indicates that if he had the money, he'd give it to John Carpenter and Russell to make the movie. You can read Boucher's synopsis below. "When a primordial evil is released by a team of scientists digging in the North Pole on Christmas Eve, the residents of a small town rapidly become infected and transformed into nightmarish creatures. Their only hope is a mysterious man (Kurt Russell) held at the local police precinct who claims to be Santa Claus." Adding to The Christmas Chronicles horror movie is the addition of the John Carpenter song "Distant Dream" from his Lost Scores Volume II record. One can easily tell that a lot of hard work and effort went into creating this edit that looks like it could be a real horror movie hitting theaters next year. It would be great if a studio threw Carpenter millions of dollars to actually go in and turn this fan edit into a reality. John Carpenter is currently taking a break after working on the score for the latest Halloween movie and acting as an executive producer on the project. After that was complete, he went on the road during the month of October and November to play some of his most well-known material and some new pieces as well. As far as returning to do a Halloween sequel, the director/composer says that he would love to return to work on it after his break. Hopefully Carpenter does return and treats us all to some more new music. As for this excellent fan-made edit of The Christmas Chronicles, we'll just have to keep watching and imagining what could have been had a studio approached John Carpenter into making the project a horror movie instead of a boring ol' holiday movie. With that being said, Netflix says that the movie was streamed over 20 million times in its first week alone, which is a lot higher than this YouTube video has gotten in the last few days since it was posted. You can check out the creative fan edit below, thanks to P.L. Boucher's YouTube channel.